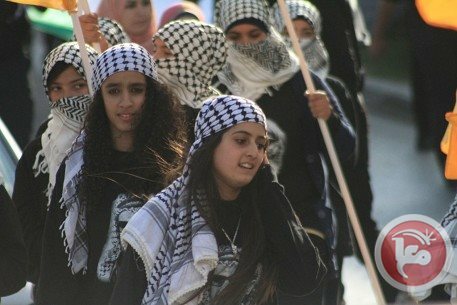 BETHLEHEM (Ma’an) — Thousands marched in the streets of Bethlehem on Saturday to mark Palestinian Independence Day and the 10th anniversary of Palestinian leader Yasser Arafat’s death. The celebrations came on the 26th anniversary of the Palestinian declaration of independence, signed by the Palestinian National Council on Nov. 15, 1988. Although many feared the move would endanger the rights of millions of Palestinian refugees to return to their homes, others were optimistic that finally Palestinians would be represented on the world stage as an independent actor. On the 26th anniversary of the treaty’s signing, the PLO said in a statement that despite the Palestinians’ historic move in 1988, in the years since Israel had failed to be a partner for peace. Although the declaration paved the way for years of popular struggle culminating in the historic Oslo Peace Accords with Israel, in the years following Israeli expansion and colonization of the West Bank and the Gaza Strip increasingly dimmed the prospect of a two-state solution.